Disclosure: I received a balance bike for review from Strider. All opinions are my own. Mason has been itching to follow Kenzie on her bike for some time now. Although he will occasionally ride his trike, he likes the idea of two wheels. Although he's tried out the hand-me-down wooden balance bikes from Kenzie, they both were never completely fond. 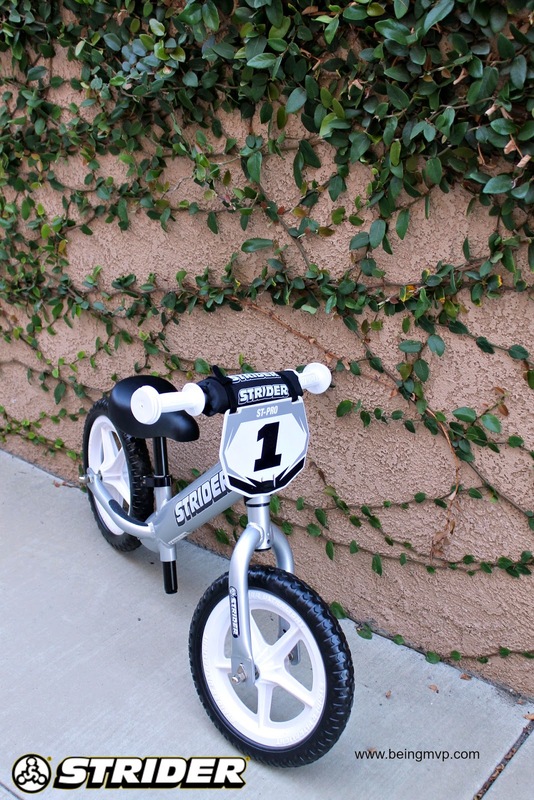 Enter the Strider Pro Balance Bike. When his eyes first saw the silver and black two-wheeler out of the box, I couldn't assemble it fast enough before his little legs wanted to hop on. Not only is the design rad, it is extremely light - 5.3 lbs - which means we can take it along everywhere. The seat is adjustable (no tools needed) in just seconds which means your child can cruise immediately after putting on their helmet for safety. The handlebars are easy to grip with Mason's tiny hands. The tires are made of EVA polymer (industrial foam) which means no need for a tire pump - hooray! Two seats are included with the Strider Pro :: The durable, all-weather mini-saddle is designed specifically for beginning riders and their tiny hips. Smaller, narrower, and lighter than a typical saddle, this seat allows for proper riding position and posture. The Pro model also includes a padded XL saddle and long seatpost to fit kids over 3 years and allows seat height adjustments up to 48cm (19”). I put the padded XL saddle seat because Mason is almost 3 years old and he just loves it. Mason was a natural and zooming all over the place. He definitely has the balance thing down and isn't afraid of a little wobble. I'm guessing he will be passing the training wheel stage before Kenzie! Strider offers a full line of bikes for 18 months - 13+ years as well as accessories. Check it out and find the perfect fit for your child. 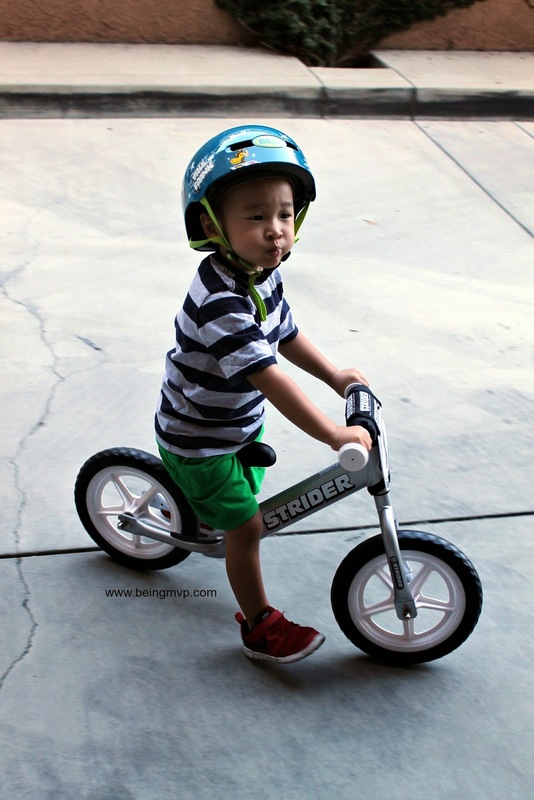 Have you been looking for a lightweight balance bike for your tot? My youngest had one of these when he was little and it was such an amazing thing! 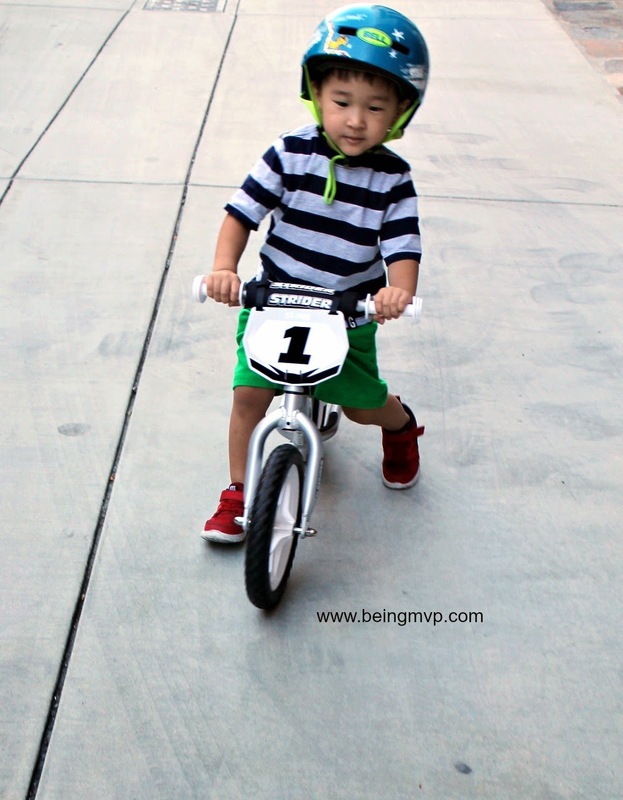 It helped with his balance so much and he never even needed training wheels when he moved to a traditional bike! Now that is one nice balance bike! So sporty looking and fits your little man perfectly! I've heard great things about balance bikes for helping kids learn to ride bikes without training wheels. Now that my kids are 5 and 6, I wish I would have opted for one when they were younger! Balance bikes are so cool! I'm sure they were around, but I had no idea they existed when my kids were learning. What a neat bike! We're way past that stage now but I remember how exilirating it was for our girls to make that transitiion from trike to bike. Unforgettable! That thing is so cool! It would definitely build biking confidence! I had no idea Strider bikes made a Strider Pro version! My daughter loves her Strider, but she's almost 4 and has pretty much reached the height limit for the seat. I wish we would have known about this version so it would have lasted her a bit longer. Awesome! I can't believe that an 18 month old can use this bike! My son would love it.